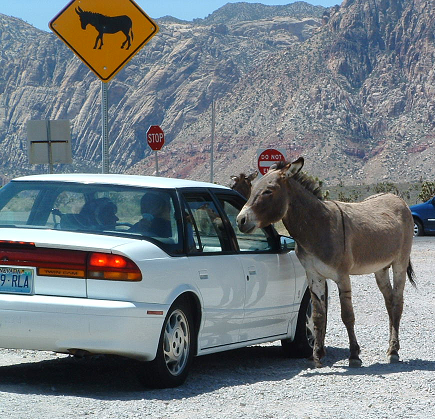 For RVers visiting the Red Rock area of Southern Nevada near Las Vegas the wild burros that hang out along the roadside have become a major attraction--and a major hazard. Having realized that people will feed them, the burros often wander into the road when they hear vehicles approaching thinking it's dinner time. They are quite often right as people regularly feed them. However in recent years, several have been hit by vehicles and have had to be euthanized. Besides the damage to the poor burro, think of the damage an accident with one of these large desert animals would cause to your RV. Take precautions. Slow down when in the area, avoid driving at night, and be ready to stop quickly. And don't forget, there is a fine for feeding them. In fact, it's a good practice that if you have to drive anywhere at night in wild areas, slow down and be especially on the alert for wildlife. Thanks for the tip, we'll be in the wild burro area around late February.